As I was perusing their outdoor patio furniture, I stumbled upon the most charming Butler and Tea carts. I have to have one! Like seriously, HAVE to have one. The cart that I love most is actually called the Briarwood Tea Cart. Can't you imagine a bright Springtime day spent outside with a whimsical tea set laid out upon an ornate English-style wrought iron cart? I'd love to do my blogging in such a fashion! Tea and key strokes ... sigh. 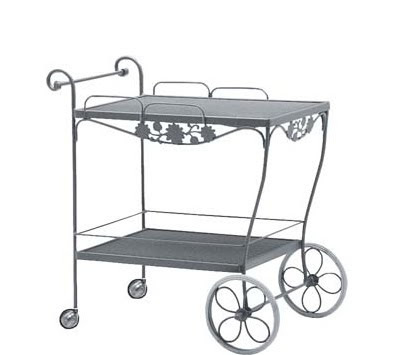 But then reality hit and it dawned on me that even if I had the perfect tea cart, I still don't have a clue as to what patio dining sets would work for my outdoor space. My current setup is a sad mashup of second-hand weathered chairs and my previous dining table, so I set off to find an Outdora set. My boyfriend has this strange aversion to wicker furniture, so I sadly passed that section by and serendipitously found the most romantic Bistro-style sets. With our 8 year anniversary coming up this summer, I feel like I need to recreate a Lady and the Tramp scene with one of these sets! Never heard of it but it sound's great! I would love a little tea cart! I'd love a tea cart too but to hold cocktail glasses, decanter, and napkins, etc. I think they're so nice!